Ruins of a small castle set in a most picturesque environment. The castle is subject to an extended programme of stabilisation and therefore the interior is not open to the public but can be viewed through the fence. Extensive scaffolding, required to sustain the castle ruins and now having been in place for years, does mar the view. 1. The settlement of Cadzow was renamed Hamilton in 1445 in honour of the Earl of Arran. During its use the castle was known as the ‘Castle in the Wood’ but was later referred to as Cadzow Castle to distinguish it from Hamilton Palace/Castle (which was demolished in 1928). Scaffolding!. 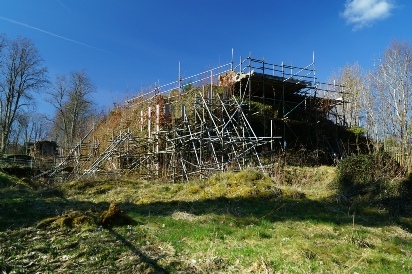 The castle has been buried under scaffolding for years as part of Historic Scotland’s attempts to stabilise the structure. Notes: The remains of the castle are located within the grounds of Chatelherault; a palatial hunting lodge built by the Duke of Hamilton in the eighteenth century. There is ample free parking and the castle is a short walk (well sign posted) from the car park. Initially an earth-and-timber fortification that was used as a hunting lodge, Cadzow Castle was later upgraded into an artillery fortification. Situated on a prominent position overlooking the River Avon, today the fortification is structurally unsound and is the subject of extended conservation efforts to stabilise it. The first castle was an earth and timber motte-and-bailey fortification built in the late eleventh/early twelfth century in a different location (Hamilton Low Park) from the remains seen today. 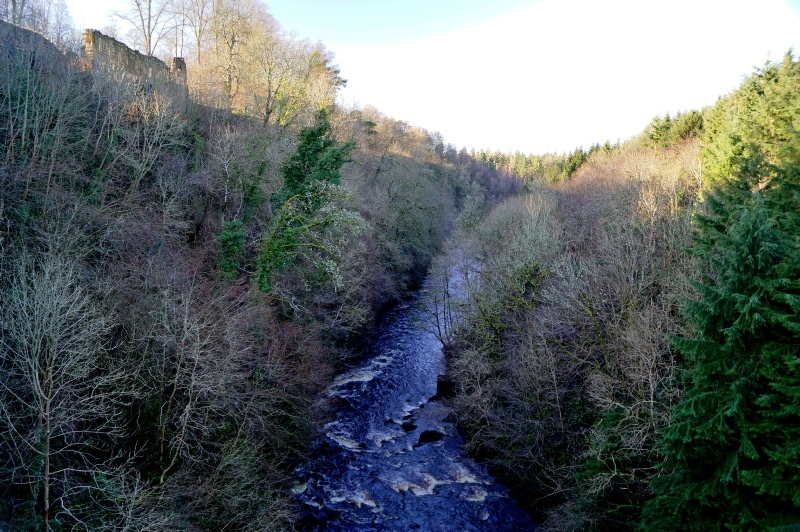 The first surviving record notes it was used as a hunting lodge by David I in 1139 but by the mid-fifteenth century it was replaced with a masonry castle – known as the Castle of Hamilton – by James Hamilton, Earl of Arran. His offspring included Sir James Hamilton of Finnart, his illegitimate son, to whom the Earl granted the land on which the current castle sits. It is believed it was Sir James who raised Cadzow Castle most probably in the 1530s concurrent with his construction of Craignethan Castle. Cadzow Castle briefly participated in national events in the mid-sixteenth century when the then owner of Hamilton Castle - James Hamilton, now Duke of Châtellerault – opposed the marriage of Mary, Queen of Scots to Lord Darnley. In 1565 Mary attacked Hamilton, including Cadzow, briefly forcing the Duke into exile. Nevertheless three years later, following her escape from Lochleven Castle, she stayed at Cadzow under the protection of the Catholic Hamiltons before fleeing to England. Mary was succeeded by the young James VI who was head of a Protestant regime. In 1570 the castle was attacked by Sir William Drury who was heading an English force sent north to aid the young King by Queen Elizabeth. Hamilton Castle itself was burnt due to the Catholic sympathies of its owners but Cadzow Castle seems to have survived this assault and was later re-fortified by the Hamiltons to support artillery. The upgrades proved insufficient for the castle was attacked in 1579 by John Erskine, Earl of Mar. Successfully taken, then slighted with explosives, it was never rebuilt.